This Lester the Whiz cat was given to me by my girl friend for my 30th birthday and was lost sometime ago. 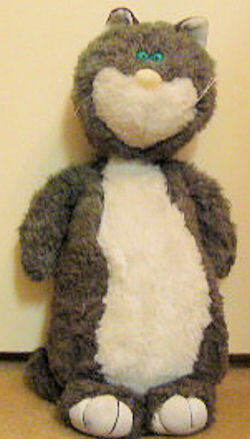 It was a grey and white stuffed cat about 12″ tall by 5″ with green eyes. Originally there was a vest and pencil holder on his chest. It was purchased in a Hallmark card store in 1987. If you can find one for me I would sure like to have it, as it meant a lot to me. Lester the whiz was from a series of cats called Purrsonality Cats from Hallmark.